Any self-respecting gardener wants to get a huge harvest quality and beautiful cucumbers. Is not a secret that to achieve this effect, the cucumbers should be carefully and regularly feed during their growth. Even if the Bush is formed of the ovary, the process of feeding must continue. However, in order to gather the expected harvest, you should understand those fertilizers, which are used to feed the fattest cucumbers, and know how to use them correctly. The scourge of cucumber, which appeared in the ovary, require two feedings. The first priority is to provide great quality crop, and the second is to extend the fruiting period. In both dressings need to use different fertilizers to choose who should be strictly according to the needs of crops. At this stage, the cucumbers need of such microelements as magnesium, potassium and nitrogen. 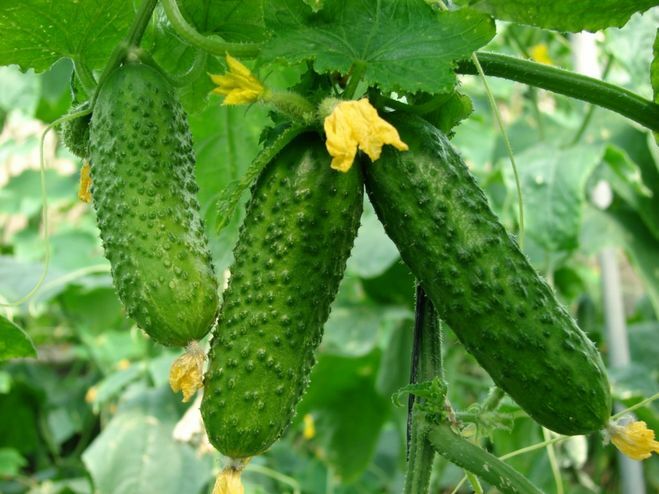 At the initial stage of fruiting cucumbers it is recommended to use the so-called "green" fertilizers: compost, infusion concentrate, diluted 1:5, ash or mullein. Of the many mineral supplements is best to choose potassium nitrate dissolved in an amount of 25 g per 10 liters of fluid, or urea, the proportions of which 50 g per 10 liters of water. To the benefits of feeding was maximum, to make it should be in moist soil. In addition, cucumbers can be sprayed with a urea solution, it is necessary 12 g of a substance to dissolve in a bucket of water. Urea could cause burns on the leaves of cucumber, so spraying should be carried out in the evening or in cloudy weather. Fertilizing cucumbers ash can be carried out in open areas and greenhouse areas. It is necessary to dissolve 250 g of ash per 10 liters of water, stir the slurry and pour it on the plants. •A solution of one Cup of ash in a bucket of water. •Urea is dissolved in an amount of 15 g per 12 liters of water. •A solution of baking soda in a proportion of 30 g per 12 liters of water. •Infusion of musty hay, which should be able to withstand for two days. In recent years gardeners have become a popular dressing cucumber soup with a bread or yeast solution. If properly used fertilizers for cucumbers in the fruiting period, harvest will never yellow, sluggish and curves of the fruit.